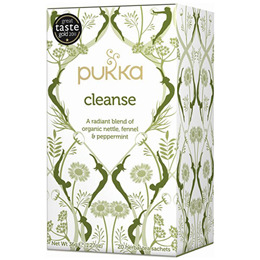 Pukka Cleanse Herbal Tea purifies with organic nettle, fennel & peppermint. An aromatic blend full of flavour. Nettle leaf (40%), peppermint leaf (25%), fennel seed (25%), dandelion root, licorice root, aloe vera inner leaf (concentrated natural extract). Below are reviews of Pukka Teas Cleanse - Organic Nettle Tea - 20 x 4 Pack by bodykind customers. If you have tried this product we'd love to hear what you think so please leave a review. One of my favourite Pukka teas. I usually drink this tea at bedtime. It settles me for the night whilst detoxing the body while I sleep. I like these as long as I don't over steep the bag. A good blend as first nettle tea I've enjoyed.